Rockville, Md. – EyeBlack.com, the official EyeBlack of athletes and fans, and Baseball Factory, the nation’s leader in player development and college recruiting, today announced the creation of a formidable partnership that will enable each company to strengthen its position within the baseball and softball marketplaces, as well as other future verticals. As leaders within their respective industries, this partnership also aids each company’s long-term growth strategy as there are multiple synergies between the two organizations. The initial term for the deal is two-years. EyeBlack.com becomes a key part of the Baseball Factory team, whose other major partners include the likes of Under Armour, Louisville Slugger and Little League® Baseball. EyeBlack.com will have a significant presence at all of Baseball Factory’s programming, including camps, regional events, tryouts, etc. The relationship includes a strong digital presence with both entity’s online assets, promotional avenues and more. For Baseball Factory, part of the relationship will enhance their softball initiatives as it will enable the company to benefit from EyeBlack.com’s relationship and product line with Jennie Finch, arguably one of America’s best-known female athletes and the most popular domestic name in women’s softball. Baseball Factory will be able to offer its customers a series of cool, edgy products through the EyeBlack.com extensive catalog of themes and designs. Based in Rockville, Md, EyeBlack.com produces innovative sports products that are used worldwide by athletes to enhance their on-field performance, while enabling fans to express their support of a team or a specific athlete. The company offers five main products, manufactured solely in the United States, and made from latex free medical grade tape that is safe, tested and can breathe on the skin. EyeBlack.com is an official licensee of Major League Baseball (MLB) and Major League Lacrosse (MLL), and has partnerships with National Football League players Marshawn Lynch (Seattle Seahawks), Stevie Johnson (Buffalo Bills), Adrian Wilson (Arizona Cardinals) and LaMarr Woodley (Pittsburgh Steelers), along with World Tennis Association female athlete Bethanie Mattek-Sands and Olympic Gold Medal softball star Jennie Finch. 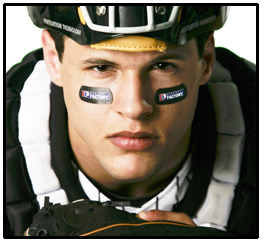 Additionally, more than 400 collegiate programs across the nation wear custom EyeBlack.com products. Away from the athletic field, EyeBlack.com collaborates with a number of nonprofits, corporations and others to create customized EyeBlack for their respective events, charitable causes, etc. Baseball Factory (baseballfactory.com) was founded in 1994 by Steve Sclafani to provide a service that would advise and educate players on the college recruiting process. Today, Baseball Factory holds over 500 events each year and provides players nationwide with the very best instruction, tournament competition, and college planning and guidance. It has developed programs to provide players, parents, high school coaches, college coaches, and professional scouts with year round advice and training so that they all can benefit from Baseball Factory’s longstanding relationships in the baseball community. Baseball Factory provides life changing experiences through world class instruction and ongoing college recruiting assistance to insure that our players find success at the high school, college and professional levels. Baseball Factory events have featured more than 260 players who have played or are currently playing in the Majors and over 40,000 alumni have gone on to play in college. 98% of all Division 1, 70% of Division 2 and 60% of Division 3 college baseball rosters have at least one Baseball Factory alum.